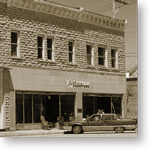 Leiser Furniture, family-owned and operated for over 116 years, is THE place to go when you are in search of fine quality furniture for your home or office. Whatever your budget, Leiser Furniture will help make your house a home – satisfaction guaranteed! You’ll find Leiser Furniture nestled in the heart of Illinois, just 80 miles southwest of downtown Chicago. Feel free to take your time while browsing our showrooms… from country to casual, traditional to contemporary, Leiser Furniture has it all. If you can’t seem to find the perfect bedroom suite, office desk or dining set on the floor, just let us know! The staff at Leiser Furniture will work with their manufacturers to find what you need fast – and ensure your purchase is exactly what you want it to be. Visit Leiser Furniture today for a truly unique shopping experience!